New Yorkers love their MetroCards and now New York’s Metropolitan Transportation Authority is hoping that they also embrace print advertising on these iconic yellow cards that are used to electronically pay for subway and bus fares. The transportation organization has started rolling out ads on the front of its MetroCards with the Gap as the very first brand to jump aboard the ad train. Adweek.com reported on how these cards are literally placing advertisers directly at people’s fingertips. 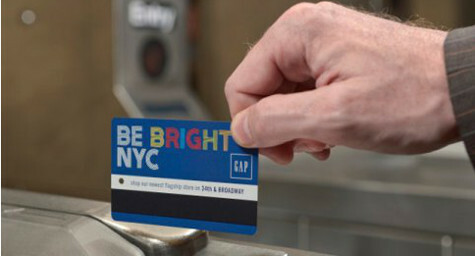 Cards promoting the Gap entitle users to 20 percent off at New York City Gap stores through mid-November and are available at ten Manhattan subway stations. These specially designed cards feature the phrase, “Be bright NYC,” with the word ‘bright” in multicolored letters. “It is one thing to put an ad on the MetroCard. This is another thing entirely: the card is an ad,” said one commuter who was surprised to see their card become a mini-billboard. While a few New Yorkers are complaining about MetroCard advertising, it’s hard to deny the appeal of saving 20 percent at a popular store. Besides, most New Yorkers seem too busy trying to catch their subways and buses to make a big deal out of a pocket-sized ad. To discover creative ways to use print advertising to capture your audience’s attention, contact MDG Advertising today at 561-338-7797 or visit mdgadvertising.com.